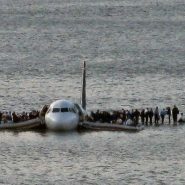 On Jan. 15, 2009, a US Airways Airbus safely landed in the Hudson River after striking a flock of geese while taking off from New York City. For survivor Ric Elias the experience of almost dying left a lasting impression on him as a human being, husband, and, in his eyes most importantly, as a father. “15, 14, 13.” You can see the water coming. And as we’re coming down, I had a sense of, wow, dying is not scary. It’s almost like we’ve been preparing for it our whole lives. But it was very sad. I didn’t want to go; I love my life. And that sadness really framed in one thought, which is, I only wish for one thing. I only wish I could see my kids grow up. About a month later, I was at a performance by my daughter — first-grader, not much artistic talent–Yet! This is beautiful and very inspiring. I´m with my kids in vacaction now and this message really strengthened me.stregthened the value of my work. of this precious work of parenting. thank you.